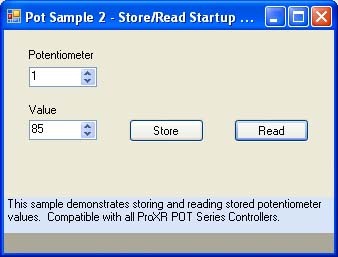 The POT16PROXR offers 8 RS-232 controlled potentiometers, and are ideally suited for integration into various types of test instruments, programmable amplifiers, programmable power supplies, and anything else that can benefit by software controlled resistance variation. As a general rule, potentiometer devices often require external circuitry. For instance, it is not possible to control the brightness of a light bulb directly or the speed of a motor without some additional electronics. 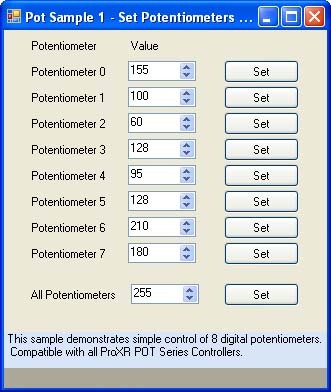 Below are samples included in Component Library for Potentiometer Boards. The Component Library is a plug-in for the Visual Studio 2005/2008 that greatly simplifies the communications to the NCD product line. The samples can be run in Visual Studio and fully customizable to your needs. 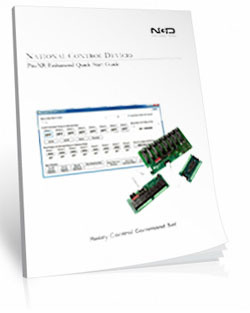 Our POT Series controllers offer our customers the capability of integrating programmable digital potentiometers into their next computer control application. 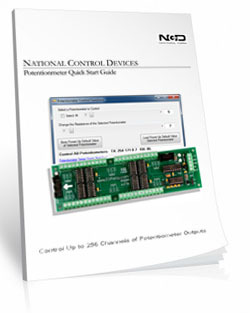 Potentiometer controllers are available with 10K, 50K and 100K programmable potentiometers. It is possible to set the power-up default state of the first 48 potentiometers. It is also possible to control each potentiometer in 256 steps,allowing fine adjustments under software control. You can control up to 256 potentiometers under software control using additionalUPOT16 expansion modules, you can control each individually or all simultaneously. In addition to potentiometer control the POT and UPOT series controllers include the ProXR command set, allowing you to plug in up to 256 relays into the expansion port. 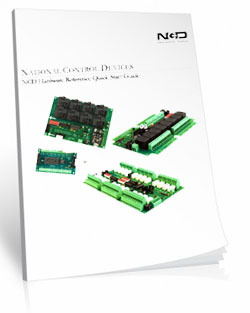 Please keep in mind; our POT series controllers offer a resistance output, and cannot provide a voltage output of any kind without additional electronics. 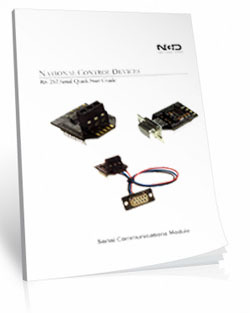 The potentiometers are limited to applications that operate in the 0 to 5V range. Each potentiometer has a maximum current capacity of 1ma. Exceeding these rating will immediately damage the controller. Potentiometers have 3 Connections: A, Wiper, and B. When a low value is sent to the controller, the wiper moves closer to A, decreasing the resistance between A and the wiper (increasing the resistance between the wiper and B). When a high value is sent to the controller, the wiper moves closer to B, decreasing the resistance between the wiper and B (increasing the resistance between the wiper and A). The first 48 channels of wiper values can be set to a power-up default state. It is possible to set the wipers on all outputs individually or simultaneously. Send commands to program the output resistance of each individual output, or you program all outputs at the same time. Other commands allow you to set the startup resistance of each output. The ProXR command set allows you to send commands to activate relays, deactivate relays, control all the relays at one time, plus you can send commands that tell a relay to turn on for a few seconds, minutes, or hours. You can assign 16 timers to any of the 256 relays, and set the timers to go off after the duration has expired. 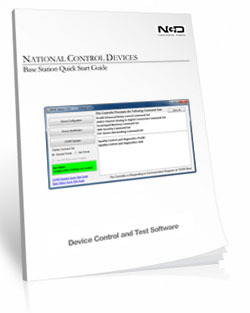 The complete command set can be found in the ProXR Quick Start Guide located in the Data Sheets tab above.